Viewing time: 4 min. 58 sec. The Write Question is a weekly video podcast all about writing. 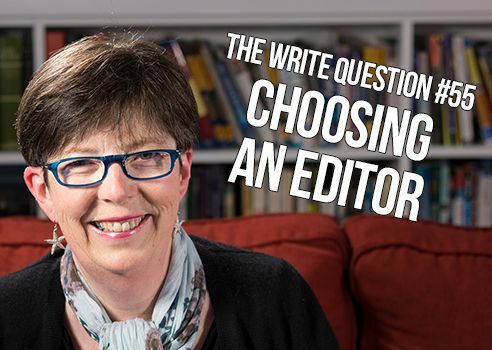 Today’s question focuses on hiring editors. If you have a question you’d like me to answer, email me at daphne@www.publicationcoach.com, tweet me @pubcoach, or leave a message for me at the Skype account, The Write Question. Welcome to The Write Question, I’m Daphne Gray-Grant. Today I’m giving advice on hiring editors. Thanks for the question, Catherine. For more than 40 years I have worked as an editor and hired many editors. But I can remember how nerve racking it was to trust someone else the first time. I think you are are being very wise to be careful about finding the right person. Hiring an editor is like hiring a teacher, a therapist, a personal trainer and a contractor all rolled into one package. If you do not hire the right person you can end up making yourself miserable or, even worse, spending a lot of money and not getting a good edit in return. To answer your main question however, I don’t think it’s necessary to have someone who is familiar with the theory you mention and, in fact, it might even be a disadvantage. Good editors deal with information that’s new to them all the time. Really, it’s part of their job description. Further, someone who is unfamiliar with your theory is likely to do a better job of ensuring your explanation is clear to other readers who are also unfamiliar with it. But let me also address the second part of your question. You referred to an editor who “recognizes quality writing.” This is like saying you want a surgeon who is good with a knife or a seamstress who knows how to use a sewing machine. By definition, they do! Far more important, is whether the editor is someone you can get along with. My own favourite editor is a person with whom I have interesting conversations. She asks about my kids; I ask about hers. We talk to each other about our travels and about what novels we’re reading. In many ways, we’re friends! This makes me more able to trust her suggestions and it allows her to understand my tastes. The thing about editing is that it’s not entirely black and white. There are a few issues where one decision might be right and the other wrong, but the vast majority are matters of taste. If your editor understands your taste, you’re in good hands. Go to a list of them. I’ve included links below to databases with editors in the US and Canada. I assume similar links exist for other countries as well. Look for someone who specializes in your genre: fiction or non-fiction. Generally, you don’t need to get much more specific than that but certain sub-genres, such as self-help, might benefit from an editor who has experience in that area. Check their references, following up with at least three of them. You want to find out how pleasant the person was to deal with and whether they were able to meet their deadlines. Then, DON’T hire the person for your book immediately. That’s way too big a commitment to make to someone you haven’t tested. Instead, hire them for a small job. Get them to edit a blog post, an article or a report. You want something that’s small and low-risk for you. If, after that trial, you would be happy to invite them to your house for dinner, then you will likely have a good editor for your book. I know this might sound like a lot of effort, but remember that you’ll be working with this person for several months and you want to like and respect them. Thanks for your question, Catherine. If you can approach hiring an editor as you’d approach hiring someone to renovate your house, I know you’ll be able to find the right person.